Our marketing strategy is based on the principle of knowledge-sharing. We use newsletters and social media to inform our clients about best practices and standards. Would you like to stay up-to-date? Follow us on social media and subscribe to our newsletters. Van Haren Publishing has more than 20,000 worldwide followers on social media and 90,000 subscribers to our newsletters. In addition, we share our knowledge via blogs and keep people informed about upcoming events. 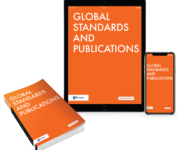 Blog: an expert in his or her field writes a ‘3 minute blog’ once a week about one of our standards, best practices or other publications by Van Haren Publishing. The blogs have a standard format, so you can be informed about ‘need to know information’ about a subject within 3 minutes. Newsletters: our newsletters inform you about best practices and standards within our four main sectors of publishing. We also use the newsletter to announce new book releases and other new publications. Events: you will find a list of upcoming events in the field of IT & IT Management, Enterprise Architecture, Business Management and Project Management.